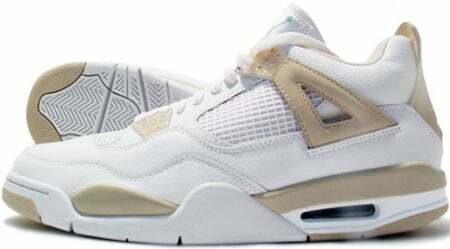 One of the first exclusive Air Jordan 4 (IV) Retro featured a White / Boarder Blue – Light Sand colorway, resulting in a nickname of Air Jordan Retro 4 (IV) Womens Boarder Blue. Many have thought of the Air Jordan 4 (IV) Retro Womens Boarder Blue as a dull shoe, but does feature some accents of a electrifying Blue, especially in the Air Bubble. Released July 22nd 2006, and the Air Jordan 4 (IV) Retro Womens Boarder Blue was a general release.